Seyedrezaei, M., Najafi, S., Aghajani, A., Bagherzadeh Valami, H. (2012). Designing a Genetic Algorithm to Optimize Fulfilled Orders in Order Picking Planning Problem with Probabilistic Demand. International Journal of Research in Industrial Engineering, 1(2), 40-57. M. Seyedrezaei; S.E. Najafi; A. Aghajani; H. Bagherzadeh Valami. "Designing a Genetic Algorithm to Optimize Fulfilled Orders in Order Picking Planning Problem with Probabilistic Demand". 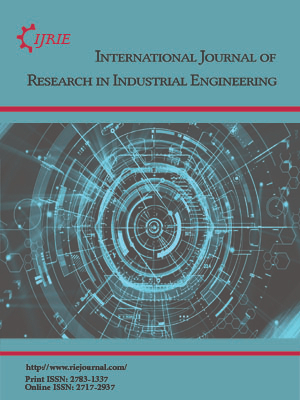 International Journal of Research in Industrial Engineering, 1, 2, 2012, 40-57. Seyedrezaei, M., Najafi, S., Aghajani, A., Bagherzadeh Valami, H. (2012). 'Designing a Genetic Algorithm to Optimize Fulfilled Orders in Order Picking Planning Problem with Probabilistic Demand', International Journal of Research in Industrial Engineering, 1(2), pp. 40-57. Seyedrezaei, M., Najafi, S., Aghajani, A., Bagherzadeh Valami, H. Designing a Genetic Algorithm to Optimize Fulfilled Orders in Order Picking Planning Problem with Probabilistic Demand. International Journal of Research in Industrial Engineering, 2012; 1(2): 40-57. Distribution centers (DCs) play an important key role in supply chain. Delivering the right items to the right customers at the right time, at the right cost is a critical mission of the DCs. Today, customer satisfaction is an important factor for supplier companies in order to gain more profits. Optimizing the number of fulfilled orders (An order that the required quantity of all items in that order are available from the inventory and can be send to the customer) in a time period may lead to delay some major orders; and consequently lead to dissatisfaction of these customers, ultimately loss them and lead to lower profits. In addition, some inventory may remain in the warehouse in a time-period and over the time become corrupt. It also leads to reduce the benefit of supplier companies in the supply chain. Therefore, in this paper, we will present a dynamic mathematical model to flow process /storage process of goods for order picking planning problem (OPP) in DCs. And we will optimize the number of fulfilled orders in this problem with regard to a) the coefficient of each customer, b) to meet each customer's needs in the least time c) probabilistic demand of customers, and d) taking inventory to send to customers at the earliest opportunity to prevent their decay. After presenting the mathematical model, we use Lingo software to solve small size problems. Complexity of the mathematical model will intensify by increasing the numbers of customers and products in distribution center, Therefore Lingo software will not able to solve these problems in a reasonable time. Therefore, we will develop and use a genetic algorithm (GA) for solving these problems.